All sites being monitored by the UMass Fruit program are now reporting sustained trap captures, though at very low levels. See article below for thoughts about why SWD populations are slow to increase this year. If drought and heat are the main reason, then if/when this weather pattern changes, SWD populations can increase rapidly. a spray program with recommended rotations of conventional or organic materials on a 7-day cycle (see here for table of recommended materials). To assess the effectiveness of your program, we also recommend that you perform a salt flotation test on harvested sound fruit (not cull fruit), on a regular basis. The protocol for this test can be found by going to http://entomology.osu.edu/welty/pdf/ProtocolSWD_larvae24April.pdf. The earliest ever arrival in New York State of this fast-reproducing insect rang alarm bells in anticipation of heavy infestations in early or mid-season berry crops that often escape damage. 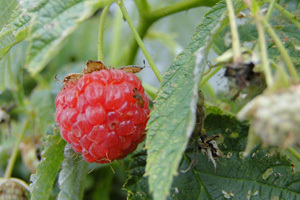 However, larval infestations have been curiously low in summer raspberry and blueberry crops sampled in many areas, including the Finger Lakes region. We suspect that the hot, dry conditions we have been experiencing could explain these low infestations. Small flies like SWD are sensitive to desiccation (drying out) and therefore prefer to lay their eggs in darker, more humid conditions. SWD are more likely to lay eggs in shaded fruit, lower in the plant canopy, and even prefer laying eggs during the cooler, low-light conditions of dusk over other times of the day. A halt in egg laying is reported in California when conditions are dry and temperatures climb above 85-90°F. A recent study conducted by our colleagues in Oregon has found that humidity not only plays a positive role in egg laying behavior, but also in the number of mature eggs carried by female SWD. (Tochen et al. 2016. 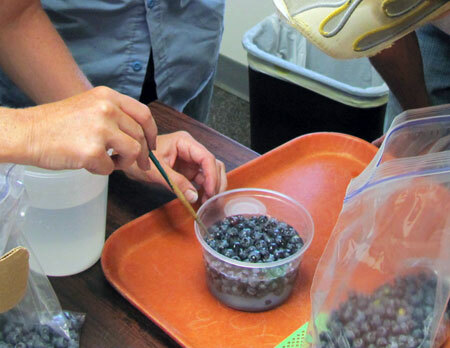 Humidity affects populations of Drosophila suzukii (Diptera: Drosophilidae) in blueberry. J. Appl. Entomol. 47-57.) In other words, a female exposed to more humid conditions will make a greater investment of resources to grow new eggs and she will choose to lay more of those eggs. This sensitivity to hot, dry conditions may explain the curiously low infestation rates we’ve seen so far in 2016, given the high daily temperatures and drought conditions. And, there are significant implications for management. Plant canopy management may be an important cultural strategy for SWD control. In addition to improving fruit quality, proper pruning can open up plant canopies. An open canopy aids in better spray coverage when applying foliar insecticides and also helps in decreasing the humidity within the microclimate of that canopy. There are ongoing studies taking a direct look at the effects of pruning and humidity on SWD infestations, so stay tuned for more information in the future. 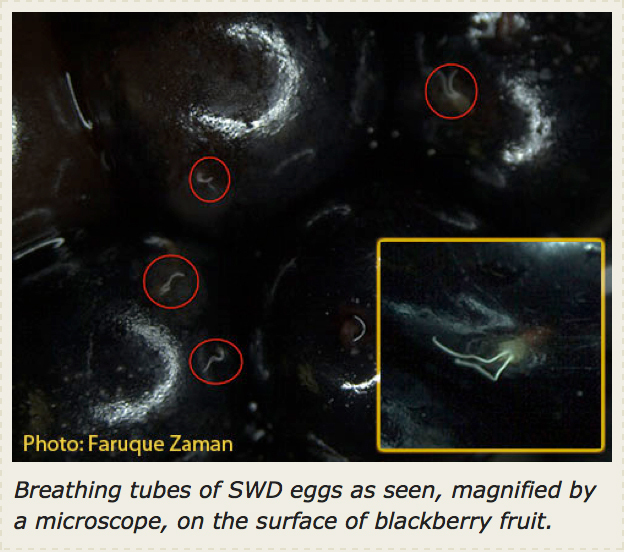 This post was contributed by Dr. Anna Wallingford, postdoctoral research associate, in Dr. Greg Loeb’s small fruit and grape entomology program, Cornell University, NYSAES, Geneva, NY. Copyright © 2012 UMass Extension, All rights reserved.